“While working in postal department in city I was also teaching yoga. I was preaching the students and neighbours to eat energized and poison less food too to keep up the good health. I used to preach but could not practice! After thinking intensely on the food production process I thought instead of asking farmers to change it is better I only begin organic farming. Hence I took voluntary retirement and started organic farming,” describes Mr. M.V.Patil the drive to turn into an organic farmer. His farmland in his village was given on lease to other farmer who was practicing chemical farming thus it was unhealthy. With the support of agriculture department he revived his farm. It took two years to refurbish the farmland. The first crop grown was millet as it a sturdy crop and grows in difficult environment too like poor soil health, less water etc. The farm is located at Guddadahulikati village, Dharwad district, Karnataka. He is cultivating as of date in 27 acre. He grows mango (Alphanso variety) in 7acres having high density cultivation of mangoes in 5acres. In rest 20acres he cultivates millets, drumsticks, papaya (Taiwan red lady), maize, ragi, foxtail millet etc. Farm irrigation is done by sprinklers and drip system. 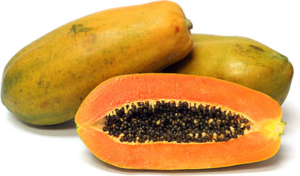 Taiwan Yellow and Taiwan Red Lady variety of papaya are the newest crops in his farm. Taiwan yellow is cultivated in 3 acre while Taiwan red lady in 2 acre. He opted for growing Taiwan yellow because, “Taiwan yellow is tastier than red lady. Size of the fruit is bigger than red lady. It doesn’t get tampered easily during transportation. The fruit has seeds that signals more nutrition. The juice is extracted and exported from the factory, if grown organically,” he elaborates. The seedling was bought at Rs. 10/seedling. It is planted at 8ft row-row distance and 7ft plant –plant distance. “I have not tried high density plantation in this crop because there is threat of disease attack as plants get less sunlight in this technique.” In one acre 800-900 saplings are transplanted. Taiwan Yellow grows well in red soil or clay soil. Within 9months of plantation, it starts fruiting. It gives fruits continuously till 5months. “Every week we get 2-4 papayas. We get at least 100 fruits from one plant. It takes 6months gap and second year it starts flowering and fruiting again. Then we can harvest for 2-3months. We can harvest commercial crop till 2 years. 3rd year yield will not be good thus plants need to be changed,” he states. Jeeamruth, vermicompost and pit compost are used as agri inputs. These are fed to the saplings/plants in every 30, 40, 50 days respectively. Once in 30 days neem oil is sprayed. “Jeevamruth is filtered and sprayed on the top of the plant and filtrate is put to the roots by drenching method. We trench the soil for 1.5ft and add pit compost of 10-12kgs and cover with soil till 6- 7inches. Then 1.25 kg vermicompost is added and seedling is transplanted,” explains Mr. Patil. Milk of plants like Calotropis Gigantea is taken and mixed with cow urine. It is kept for 10-15days for fermentation. Later the liquid is sprayed as bio-pesticide and bio-insecticide on the papaya trees. It also acts as growth promoter. Mr. Patil invests his time and energy in organic farming thus in his farm saplings grew well free from pest and diseases. The quality of the fruit obtained was excellent, “When I delivered the fruits to the factory not even a single piece was rejected,” he shares proudly. The farm produce is not sold in wholesale market to avoid agents. It is preferred to be sold to end consumers. Small quantity is sent to organic market in Hubli, Dharwad while rest of the produce is sent to factory with agreement. “According to my personal experience, inputs used to grow food organically will incur less production cost but premium price is hard to get in mandi. Therefore I process the farm produce myself and sell it in Dharwad in my own circle. I also sell at yoga centers where organic food is valued and bought at the deserved price,” he affirms.